Top 4 The Priority And Relentless Transfer Gossip. Yesterday I failed to produce a blog post as promised. You might think there was a good reason for this; a family emergency or perhaps a complete meltdown of Internet capabilities. You’d be mistaken. The single biggest contributing factor was a bout of indolence on my part, coupled with the desire to play GTA5 – I get addicted very easily when it comes to shooting/blowing up other members of the online community. So, I guess apologies are in order. There wasn’t exactly a plethora of interesting stories to write about, but, hey – I intend to jot daily and didn’t do so. I throw myself at your collective mercy (both of you). Today is mostly scattered news without anything significant or immediately jarring – no story has leapt from the screen causing my fingers to flutter across the keyboard. Instead, we’ve the emergence of what I like to refer to as “customary dross”. “We want always to be in the Champions League and this season it will be very difficult, because it’s very tight if you look at the table – every game now becomes a cup game. “We have won (the FA Cup) five times during my period here,” he added. I find the principle of what he’s saying difficult to disagree with, although some have taken it as settling for mediocrity or a case of the Club not setting it’s goals high enough. I disagree with that. The most important word from that quote is “basic” – a minimal requirement the team and Arsene Wenger sets itself at the beginning of the season. Finishing 4th doesn’t bring with it a trophy, as well all know, but it represents stability and financial gain that can be built upon – previous recruitment over the summer shows we are aiming high. If Arsenal finish 4th and don’t acquire some silverware, then I doubt anyone would consider the campaign a success, but it will have finished with us achieving the minimal requirement. Like all of you, I’d very much like the result to be different, but wouldn’t consider it an abject failure if that’s all we got. Elsewhere, as the news slows before tomorrow’s game with Middlesborough, you have the usual transfer fluff. Even with the January window now a distant memory, hit-hunters and money driven sites can’t resist the urge to lure in the unsuspecting with preposterous tales of bids, swoops, deals and such. You need only have a gander at the aggregation feeds to see that this is exactly what sells. It’s kinda sad, because amongst all that dross, it’s very easy to lose the genuinely good Arsenal writers and others, such as myself, who just enjoying rattling on everyday without actually making any salient points. This is the world of the Arsenal blogger. So, why not take a moment to read something a bit different, something someone has actually taken the time to construct. My recommendation would be this joint piece by Daniel Cowan and Jokman featured on Goonerspehere. Give it a whirl, folks. It’s very good. That’s all for today, folks. I’ll be back with more tomorrow, including a review of the FA Cup tie with Boro. The comments await you glorious digits, so make haste and send me some of your thoughts. 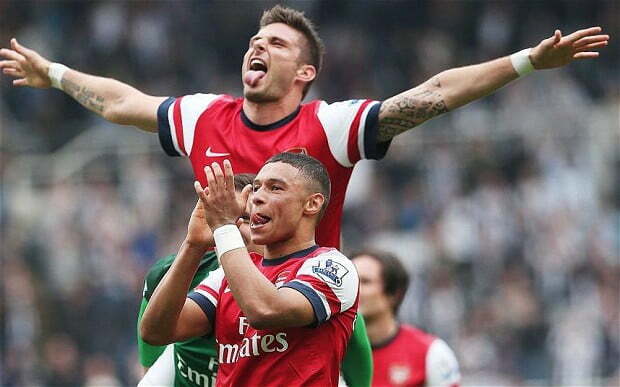 Ramsey Out Until March And A Scolding Coq. Middlesborough: Team News, Predicted Starting XI And Thoughts. I wouldn’t be happy with fourth. A top 3 finish, the FA cup and reaching the quarter finals of the champions league would be a successful season. @Veer. In an ideal world, we’ll do much better than that. 4th is the minimum requirement to me, not a success. It’s better James I think to just write about current issues or quotes from the manager and players – than to mish mash the same prattle on a dozen other blogs who are just mish mashing each other anyway. The main issues Wenger should be focused on is our injury record and the length players are out, instead of saying ambiguous things like, “Ramsey’s injury is a mystery” – Find out why you nauseating bore. He’ll look into the benefits of food supplements and other alchemy and hire experts in these fields, he’ll put players in the wilderness for smoking a cigarette, ban food items and alcohol too … but when players are out for most of EVERY season …. wrap them in cotton wool, don’t risk them coming back too early, ease them into the team over several weeks and WHAM … out until the contract is up for renewal or an International (whichever comes first) – then offer said player a 3 year deal on more money than before. Come the transfer window, follow up this pattern of your management by buying injury prone players to add to the ones we already have and try buying others like Reus. Having Diaby still in the team is inexcusable, but him I accept grudgingly because of that kick in John Terry’s head, but Walcott I feel has been replaced by Sanchez and should be sold to fund another player we need, and I feel that Wilshere has been replaced by Ozil and can be sold to fund another player we need, and that Ramsey did enough last season to keep for now but my patience is diminishing. Debuchy gets through a season with the Magpies uninjured, through the World Cup uninjured, arrives at Arsenal and WHAM. Our boy Coquelin, I remember when we bought him, has finally punched his way into the first XI and it’s considered a New Signing … but he is injury prone and will be out soon for the rest of the season. As for my view on Wilshere above, I know he has been with Arsenal since he was an embryo, but he is gash. He now puts his leg in reckless places to get it deliberately injured, a thing Van Persie did a lot, he is lazy compared to the 19 year old Wilshere who demolished Barcelona’s midfield and he bum licks Wenger all the time in the media. When Wenger was going through a period of ‘Wenger Out’, Wilshere was saying, “If the boss leaves I will have to rethink my future at Arsenal.” Got the measure of Wilshere right there. Can you imagine Tony Adams EVER saying crap like this? It goes to show as well that Wilshere will find it an option to leave for Chelshit and ManC when Wenger retires. This guy wants to be Arsenal Captain and England Captain and things bum licking managers is the way, yes he backs Hodges publicly too. He can’t manage his smoking habit or drinking habit when he is supposed to be recovering, and on the pitch he cannot manage his fitness or motivate himself to put in a full shift – so how will he manage to captain any team? Now I have to go check if GTA V is available on PC yet. @Arsenal1again: Thanks for the comprehensive comment. Not sure I agree re; Wilshere. He certainly has his faults – most of which I feel are blown way out of proportion by media vultures eager to tear down someone. That said, I think he’ll come good in the end. He’s still young and a bit stupid. If the same problems still occur in a couple of years time, then we have reason for concern.